NEW RENAULT FLUENCE COMES WITH 5 AMAZING INFLUENCE AFTER SALES AT RM110K! 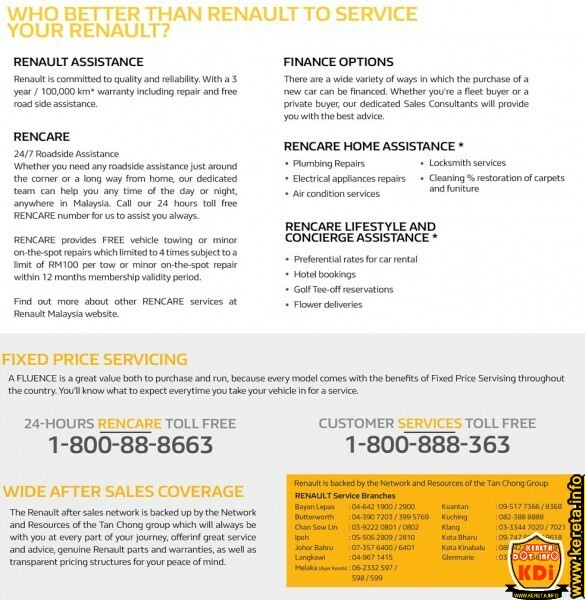 Latest renault Fluence facelift 2015 now available with 5 best after sales service including 5 years warranty, free labour and service charges, free original genuine parts, free pickup service for your car to do routine servicing at any renault Malaysia service center and free courtesy car if your car break down and needs more than 2 days to rectify the problems. What more do you want for only RM110K with all those free of mind of car ownership? The Renault Fluence facelift now is the most money saving family car in Malaysia. OTR Price without insurance and may vary in Langkawi. Valid for Peninsular Malaysia Only. Strong and sleek, the Renault Fluence will win you over with its dynamism where the laws of aerodynamics were infused with performance and comfort resulting in a sturdy, smart and functional design. The Renault Fluence is in a class of its own with a distinctly modern style and generous proportions within its segment, offering unrivalled space and high-quality equipment. Can’t do without technology? The Fluence features multi-faceted technology standards. Take the Renault hands-free card, which can be used to lock, unlock and start the vehicle simply by carrying the card with you. Simply skim your finger over the R-Link multimedia system to access all of your media content, make calls or find the quickest route using the built-in navigation system. Fancy some music? Its new radio can be connected to all of your devices. Regardless of distance, the Fluence offers a comfortable drive and a full range of equipment designed to make any journey a pleasure for you and your passengers. An interior designed to provide maximum space and comfort, an entertainment system with 3D sound positioning, regulated dual-zone air conditioning and rear air vents put you in the comforts of your home in every journey. In addition, its automatic CVT gearbox lets you enjoy all the comforts of a smooth and economical drive. Experience the spacious comfort of the new Fluence. Thanks to a wheelbase of 2,702mm, you get a significantly expanded cabin to stretch out in. There’s plenty of front and rear headroom as well as extended legroom, which stands at 238mm. A class leading bootspace of 530 litres makes the Fluence a practical sedan to fit any lifestyle and depending on your needs, this capacity can be increased by folding down the rear seats for extra space. Every Renault Fluence is engineered to place the safety of the driver and passengers above all other concerns. Equally important are the safety features which are in place to help prevent unforeseen events. The Electronic Stability Program (ESP) with Anti-Skid Regulator (ASR) helps you maintain maximum control and confidence. ISOFIX, ABS with Emergency Brake Assist (EBA) and Electronic Brake-force Distribution (EBD) are among the key safety features you will find standard in a Renault Fluence. There’s also a reverse camera to help with parking and avoid unseen objects at the rear.